I’d always put off seeing the sights when I lived in New York, always thinking I’d get to it some other day. 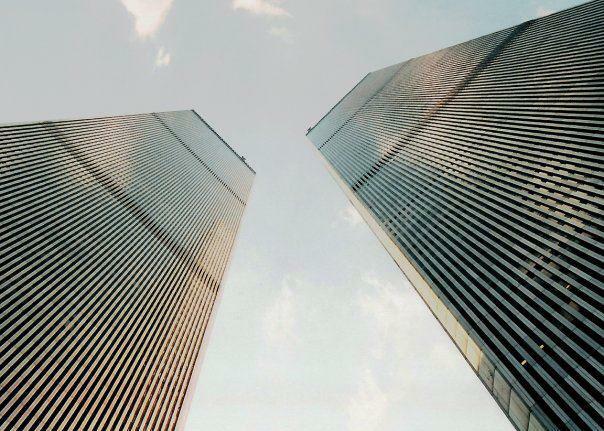 I was only inside the World Trade Center buildings twice. The first time I was a teenager and went up as a tourist to see the view from the top. The window was floor to ceiling and had a railing to hold onto. I remember standing there at the railing, marveling at the view and feeling the building actually swaying – as it was designed to do. The second time I was there to hand-deliver something from my company to the mail room in the sub basement of one of the towers. On both occasions I was overwhelmed at the size of the one hundred and ten story structures. Where most buildings in New York City are enormous, the World Trade Center buildings were colossal. If you were in front of them you would practically need to lie on your back and look up from the ground to see how high they went up into the sky. Like most everyone else, I will never forget where I was on the morning of September 11, 2001. I remember it was a sunny day and I was driving to class at college. That morning I was scheduled to demonstrate a sterile dressing change on a plastic mannequin at the School of Nursing. I remember being in the middle of my demonstration when someone into the room and said an airplane just hit the World Trade Center. Immediately I tried scanning my brain for a plausible explanation as to how someone could have misguided an airplane into one of the two buildings that could be seen for miles and miles and miles outside of the city. A few minutes later we heard that another plane had crashed into the World Trade Center. The teacher and I ran to the computer to get on the internet and find out what was happening. We never got online. Everyone else in the world was doing the very same thing at that time and the system had crashed. I drove to my sister’s house right away to watch what was happening on TV. I remember getting there just before one of the buildings collapsed. Around the same time I heard about the plane crashes at the Pentagon and in Pennsylvania. I numbly sat there with my sister and her newborn twin daughters, all of us staring at the TV. The only thing I could think of was the phrase “What the hell is happening? What the hell is happening? What the hell is happening?…” For days afterward I stayed glued to the TV watching history unfold. Along with the rest of the nation, I read the never-ending news tickers at the bottom of the screen – hoping at any moment they would finally tell the world just what the hell was happening. It is impossible to process all the horrific images of 9/11, but a few will never leave my mind. I’ll never forget seeing people running up the street to escape a mile high gray wall of smoke and ash that was trying to envelop them. Or watching day turn into night within seconds as people recorded video looking out the windows of storefronts they’d taken cover in to hide from the choking smoke and ash. TV cameras kept panning motionless scenes of destruction – mangled with twisted metal, debris and crushed fire trucks. Everything was chillingly silent except for the warped and echoing alarm systems that dutifully continued to warn of an apocalypse that had already happened. Time does not heal all wounds. Even eleven years later, just seeing a picture of that day can bring back very raw emotions. I can’t even imagine what it was like to be in New York City on that day and having experienced firsthand that unimaginable pain, loss, devastation, grief and terror. Although I no longer lived there, many of my friends were there on September 11, 2001. It seemed everybody knew someone who knew someone there. It affected the world. We all became New Yorkers on that day. Posted in Uncategorized and tagged 9/11, Firefighter, life, memorial, New York, new york city, September 11, USA, World Trade Center. Bookmark the permalink. Thanks, Naia. I can’t read this without crying. Your last 2 sentences say it all. So true. Thank you for sharing your story. That is unreal. I can’t imagine how one could witness something like this. Your life is changed forever. Your description was incredible….and sad. The people uptown had no idea how their world was seconds away from changing forever. Thank you for sharing your experience Margarita. What I describe was in the afternoon…the people uptown knew what had happened that morning. And we were all struggling to figure out how to deal with it. As we still are. All around the world! The whole world watched TV for days. I remember how quiet the skies were because there were no airplanes flying. Very eerie the first time I heard a plane fly after 9/11. Well said – it was a dramatic experience for everybody. I don’t think any body will ever forget the place they were when they heard that this happened. I clearly remember I was in class and we were all called into the library to watch the news. Living 20 minutes away from the city but being able to clearly see the skyline filled with smoke was a disturbing view. Even worse part is that the smoke stayed for a few days, as if it was a scar reminding us constantly. That must have been a terrifying sight to see, especially while you were in school. I can’t imagine the days and weeks afterward having to see that damaged skyline. The world was watching with you. Thank you for sharing your own vivid experience.